While the rest of the world has been suffering from frequent and heavy snow falls we have had very little snow until this week. Finally I had to get out my serious snow shoveling gear and while I was busy elsewhere the dogs were really having a time of their lives. We had very cold weather for weeks and finally the numbers in the thermometer were more dog friendly and these two just kept on playing the first day we had a mild and snowy day. You were wondering where to buy Anu's book KiriKari and it is available from here: http://www.apollo.ee/. You might want to look around and see if there are other books of interest as well. There are few I will want to look into. Ice Fantasia is closing slowly. 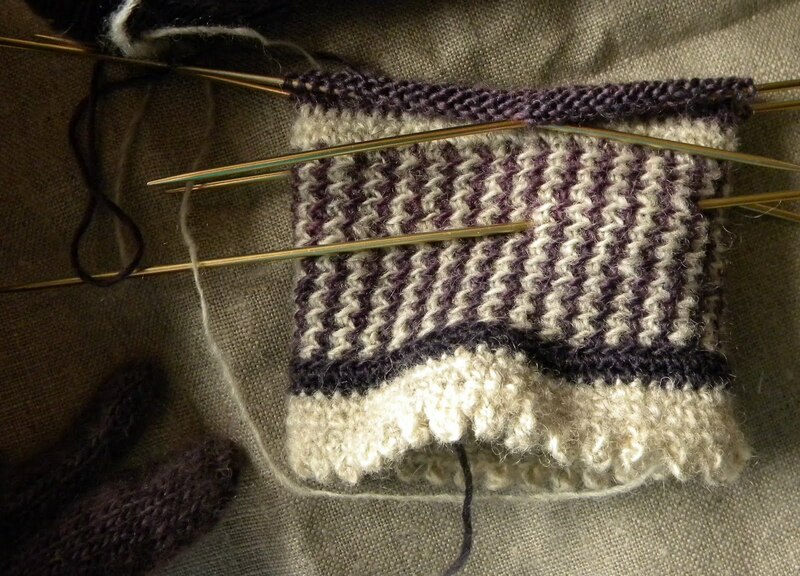 I am knitting the edging at the moment and have about 16 repeats out of 78 done. I was knitting the shawl in a good speed and the moment I thought to myself that really this is all going so well, it happened, I dropped few stitches which just happily escaped into few rows below and my heart must have skipped few beats. 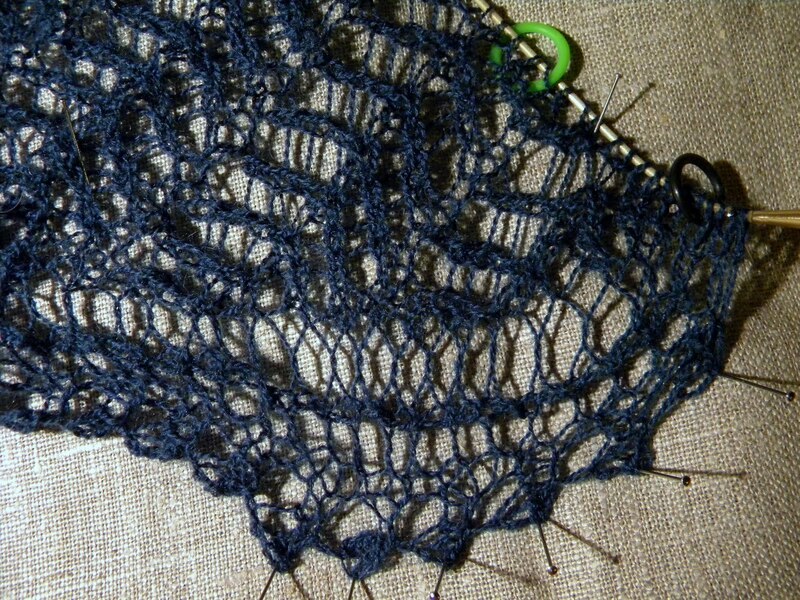 I am quite confident in fixing few mistakes but something this lacy with patterning on both sides and yarn that is dark blue, just made me sweat. No lifelines of course... It took few days to gather up the courage to try to fix it and I think I succeeded. I did look at it long and hard after I fixed it but as you know, you might not always find the mistakes the first time, some of them will surface at later examination but I have not had the courage to look at the spot ever since so I am little bit worried of looking at it when I finally get around to block it. 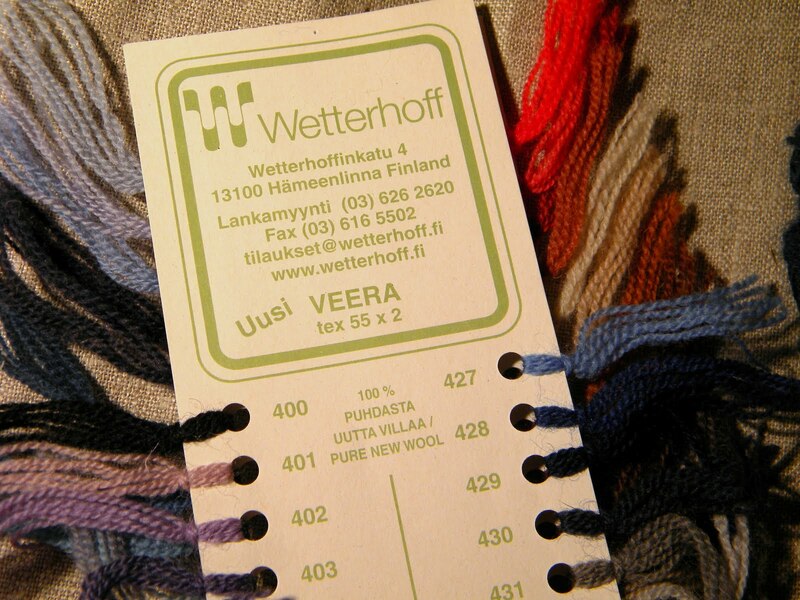 I am using Wetterhoff's yarn for the shawl. It is all wool and I am happy with it, it has lots of character, it is not as soft as these soft merinos or merino/silk blends but I expect it to wear well. Every now and then I think about crochet and look at the patterns and wonder if I should really make a plunge into it. I have been thinking of combining knitting with crochet more and this always leads me to Korsnäs sweaters (there is a book about Korsnäs sweaters called Decorative Crocheting ISBN 951-96888-4-6) and the beauty of them. I have tried this techniques few times and every time I have loved the results. I just had to try something small and light and easy again and it resulted in this glove. I am really happy with it. And definitely there is going to be more of this. This might be just what I have been looking for months, a new approach to this old new craft, something to spice up the knitting. My Maia shawl is large in the pictures, and this is due to the fact that I knitted more repeats into it, up here the shawls and scarves should be well covering... Anna, I have not seen the film you talked about in the comments, I know the book though, but don't know about the ponchos. Edit: I just got a note from my friend Inger in Norway - Hi there! - that there is a poncho in Garnstudio's site just like the one in the movie The Robber's daughter. Ok, there are the dogs to be walked, the house to be warmed and the steps to be swept off snow, a drive to the town and few other things as well, so I need to go now. You have so beutifull works! And tidy room. Mine is not. What a great way to spice up your knitting, crochet can be so pretty as an accent. Is this the room the loom was in? Where is it now? Did your daughter do any weaving? Those gloves are absolutely beautiful...I luv both the colours and the design. I know what you mean about the lace mistakes....I have been knitting along happily on my Miralda shawl when suddenly I have messed up one of the rows with nupps. I don't normally use lifelines..I feel depressed! 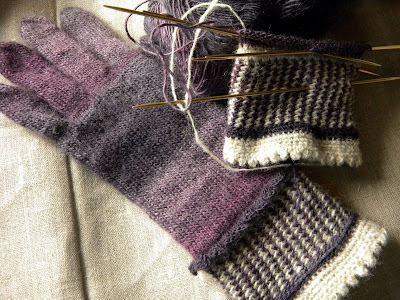 Love, love, love those little picots on the mittens! And nothing makes me laugh like dogs who love the snow! I have recently started to crochet again and I have to tell you how much I love it. It feels freeing if that is possible. The color combinations and the speed at which a project can be completed is simple amazing. I am still an avid knitter but I have decided I can crochet also. Love you tidy room and the dogs playing in the snow. I love it when people combine crochet and knitting. Go for it! 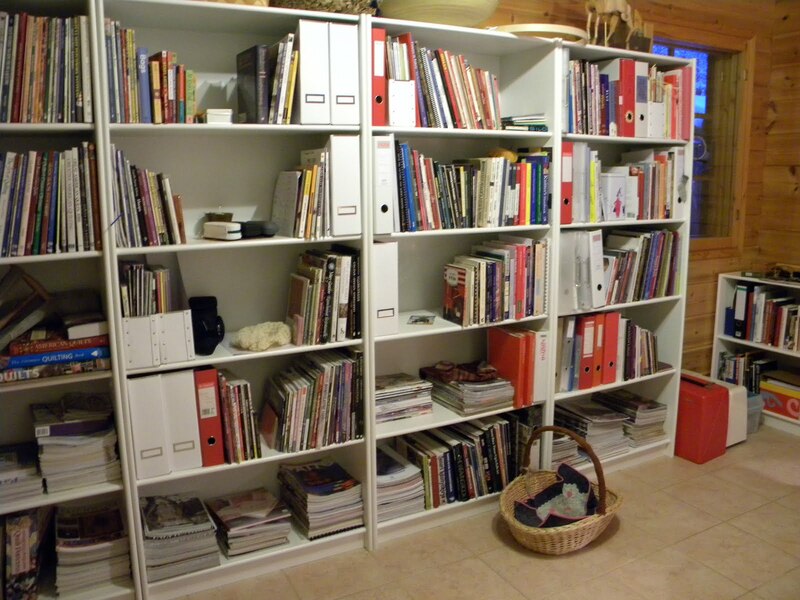 Lene, can you recommend any sources of information on Korsnäs work? I'd never heard of it, and a Google search turns up only a few links. Thank you, as always, for a blog that so eloquently celebrates beauty in nature and craft. It's lovely to hear from you again, Lene. I look forward to your posts - they always have a gentle quietness about them which calms me. Thank you. The gloves are so beautiful! Everything about them is just perfect from the colors to the edgings! Oh me, what you just described about the mistake in the lace makes me know what I had already thought before~lace knitting would NOT be for me!!!!! I picked up lace weight yarn one time and after knitting 1/2", I declared to myself there was no love there! I love the results, but I will leave them to others and admire their work! Ha! The dogs playing in the snow is so fun! Dog-friendly temperatures are what it definitely has NOT been around here! Thankfully, our hound enjoys the indoors, as well. I do so love seeing your patience and your skill with knitting. Love the pictures of your dogs! Love the pictures of your wool room. Your gloves are beautiful:-) I hope you do more of it! I'll be checking your blog often, you truly do beautiful work! Oh!!! 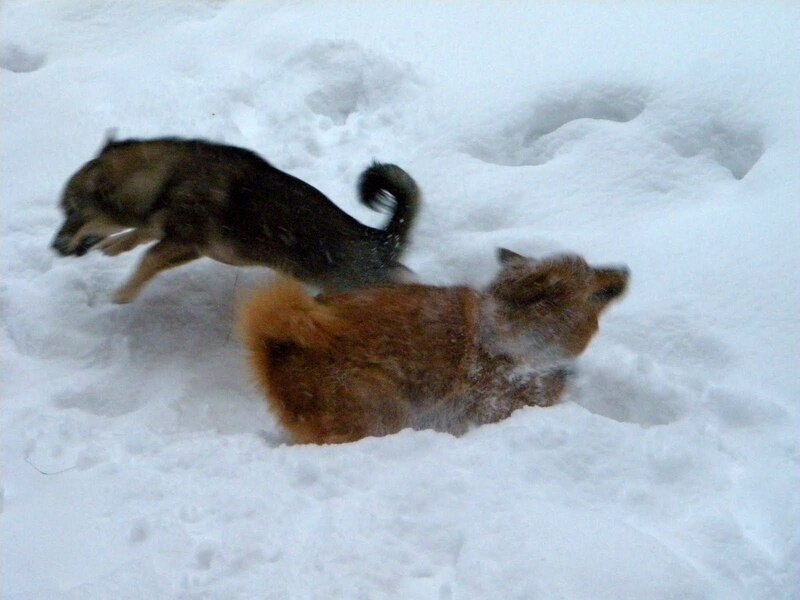 and your dogs look like they are having so much fun, wish I felt that way about snow,lol. Oh, Lene, thank you and thank your friend Inger so much! I found the hooded poncho pattern, and I am very excited to make it. Even better, however, is that I asked a silly question in Minnesota and two lovely women in Finland and Norway answered it! The beauty and wonder of the world continue to amaze me. Thank you for the glimpses you provide of life in the Arctic Circle. I'd love a room like that!! I love seeing your new projects and oh mercy, picking up the stitches on your lace, brava. 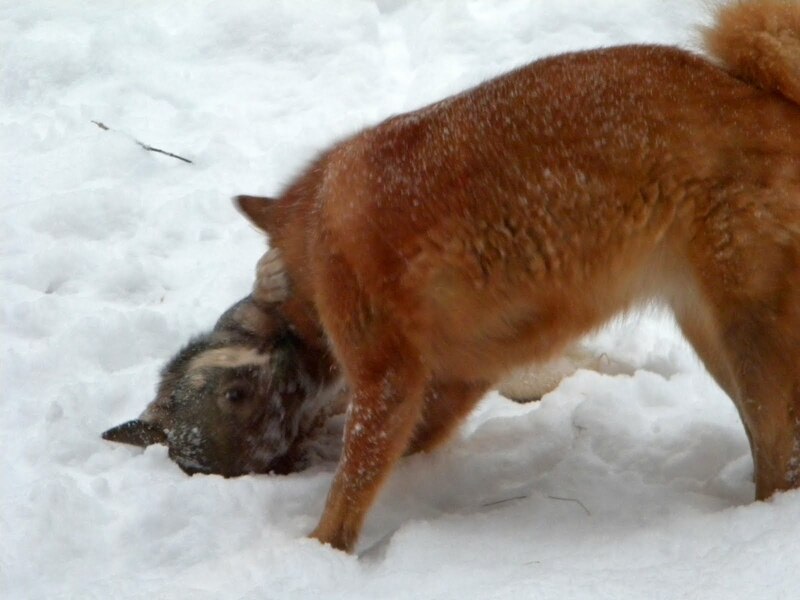 Love seeing your beautiful dogs playing in the snow. I especially love the view out the windows. winter wonderland. Such lovely pictures. 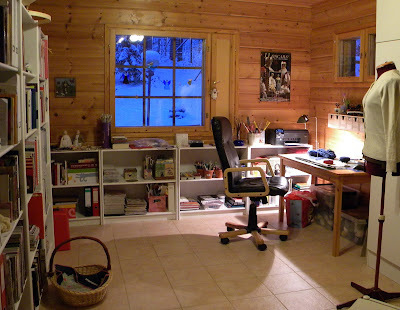 How I'd love to have a room like that! Especially one with such a lovely view. I have not sat down to read your posts in a long time and I miss you! Thank you for keeping up your beautiful work. Long ago I recall you wrote about cleaning wool garments by laying them out on the snow. Can you tell me more about that? Perhaps tonight I begin a new wool sweater. My latest projects were many sock experiments for me, and a felted hat and knit gloves for my girl. Hello, I have not sat down to read your posts in a long time and I miss you! I have missed a lot here!